Meeting time: winter: 10 a.m. - summer: 1 p.m.
All about the ARCHITECTURES IN FLORENCE. Wander among many Florentine architectures from different ages to discover the commercial essence of the city. Walk through the splendid courtyards of historical buildings to arrive at the most famous panoramic square of Florence where to enjoy the countryside and the light of the sunset: Piazzale Michelangelo. We will walk in the city to discover the everyday life of Florence and of the people that regularly experience these historic but dynamic buildings, as these structures evolved through the centuries to better accomplish their social and economic functions. We will forget for a while of the many crowded squares of Florence, but from between crossroads we will enjoy some stunning glimpses on the magnificent buildings, churches and architecture of the city center of this beautiful city. The Central Market was built when Florence was the capital of Italy in the late nineteenth century. Its huge structure is full of people, always busy eating, buying or simply looking for food, and its space is often enhanced by the presence of artists and live performers – so you will undoubtedly have the opportunity to take nice candid shots. Discover the renaissance soul of Florence walking through this well-known palace with its impressive “rusticated stone” exteriors and the cozy courtyard. Palazzo Strozzi houses everyday important art exhibitions and you can take a look and shoot the amazing sculptures in its courtyard. If you enjoyed the Central Market, this is another place you’ll love. 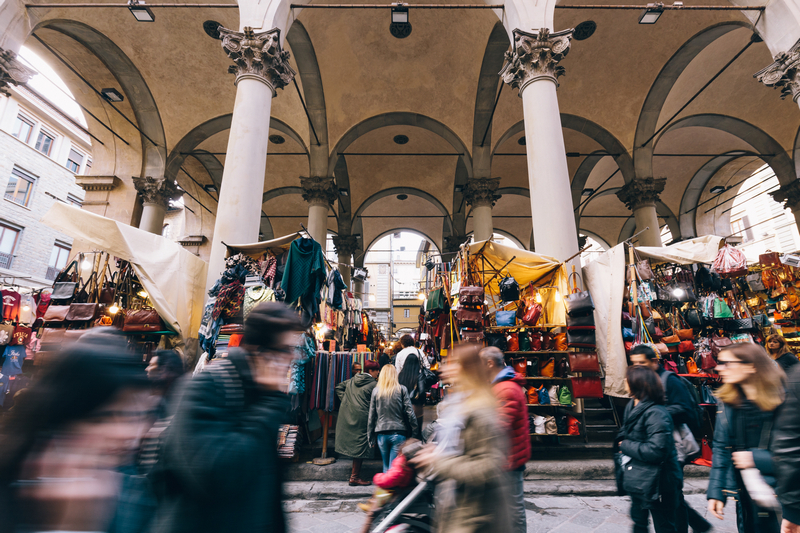 The loggia isn’t very big, but the arterial streets all around offer many subjects to portray: busy people walking by, street artists, colorful sales stands and a nice glimpse of Piazza della Signoria and Piazza della Repubblica. You can’t come to Florence and miss the medieval Ponte Vecchio stone bridge. 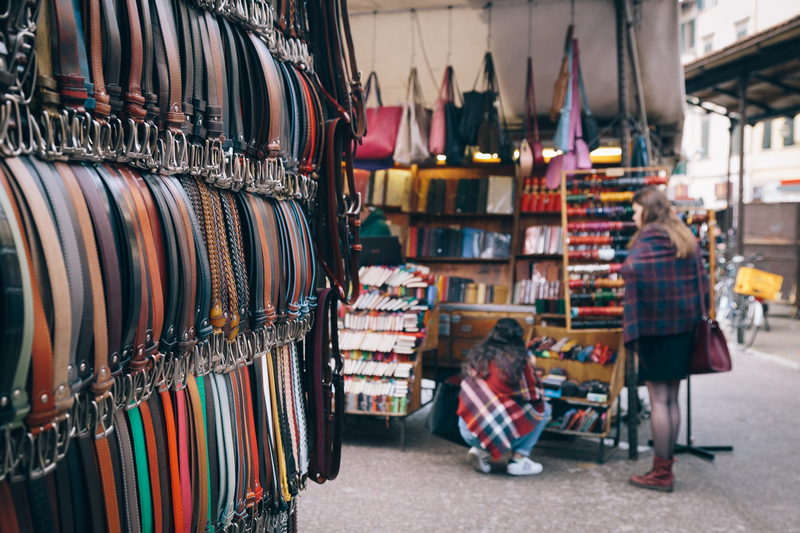 Take your time to explore its high-luxury shops and shiny lights. 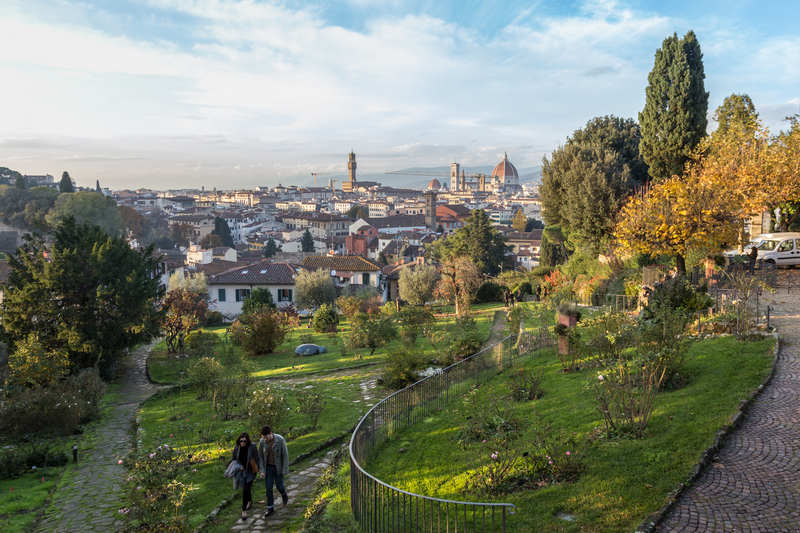 There are many ways to reach Piazzale Michelangelo but climbing up this small hill strolling through its wonderful public garden is certainly the best way to go! Here you can admire flowerbeds from all over the world, or walk on its relaxing paths observing the beautiful bronze sculptures of Jean-Michel Folon. This is a very big square overlooking the Arno River and the central historic district of Florence. It’s the perfect place to see the sun setting over the city and therefore, a very romantic location where to spend the last hours of light in Florence before having dinner. Piazzale Michelangelo is a multi-layered square and offers a lot of different spots to properly shoot the Arno river, Ponte Vecchio and the magnificent Brunelleschi’s dome. Born in Pietrasanta (Tuscany) he lives between the Apuan Alps and the Thyrrenian Sea, in close contact with nature and wildlife. His passion for photography arose from here and it is still developing focusing on landscape photography and nighttime skies thanks to the many stunning opportunities offered by the Tuscan countryside. Being highly interested in sports like mountain bike and trekking, he has been the official photographer of some important cultural and sport events too.